Description: Everyone knows Dr. Watson is Sherlock Holmes's right-hand man -- so when he goes missing, it's a shock. Even Sherlock hasn't the slightest clue as to where he could be. Enola is intrigued but wary; she's still hiding from her older brothers, and getting involved could prove to be disastrous. 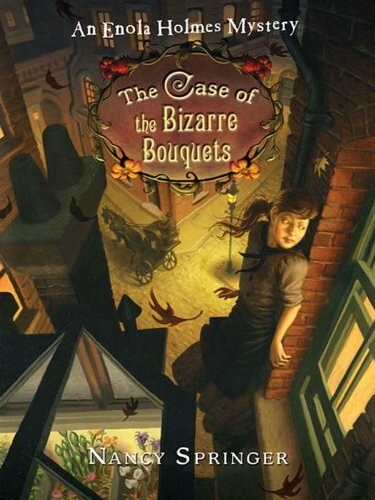 But Enola can't help but investigate, especially when she learns that a bizarre bouquet -- with flowers all symbolizing death -- has been delivered to the Watson residence. Enola knows she must act quickly, but can she find Dr. Watson in time? My Thoughts: In this third Enola Holmes middle grade mystery, Enola is hunting for a missing Dr. Watson. Of course, she also has to keep herself hidden from her older brothers Mycroft and Sherlock so that they won't be able to force her into the mold of a proper Victorian young lady. This mystery plays into Enola's strengths as she gets one major clue in the form of a bouquet of flowers delivered to Mrs. Watson in the aftermath of Dr. Watson's disappearance. The language of flowers is one that many young women of her social class are quite familiar with. In fact, she and her mother sometimes communicate in it when sending messages to each other via the Personals columns of London newspapers. But it is a language that is completely foreign to confirmed bachelors like Sherlock and Mycroft. This story gives a really good look at the way London was in 1898 with the vast gulf between the rich and the poor. It also says a lot about the lack of rights for women at the time when it was easier for a man to have his wife committed to an insane asylum than it was to divorce her. The story has exciting bits as Enola has to elude both her brothers and the villains and winds up climbing over London rooftops. It also has bits where Enola comes to terms with the mother who has abandoned her. Despite her intelligence and independence, I can't help but feel sorry for Enola who longs for a family and people to care about her and who has only an absent mother and brothers with preconceived notions of what would be good for her to fill the gap. I am eager to read more of Enola's adventures. Neither of my brothers could accept or understand a woman unattached to some man as wife, daughter or sister. Both of them dismissed women as beyond the comprehension of logical thought. Neither of them could imaginatively enter the mind of any woman.